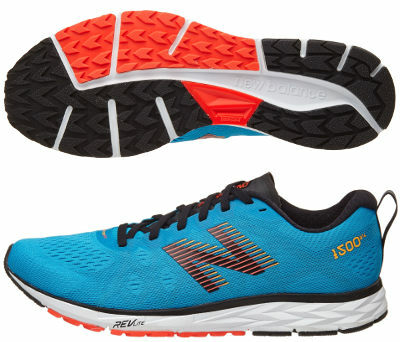 New Balance 1500 v4 are stability racing running shoes. Not many changes in New Balance 1500 v4 which is fine because it confirms the platform performs great and has been well received by target audience. On the other hand, few changes typically mean price update (aka increase) without major benefit from last edition. One interesting thing is the partnership between New Balance and Boa® to release 1500 T2 edition where classical lace system has been replaced with innovative (and patented) solution of a micro-adjustable dial, lightweight but strong cables and low friction lace guides to fasten and adjust your shoes faster, a great idea mainly intended for triathletes. Most important change compared with its predecessor 1500 v3 takes place in the upper where knit-like mesh plenty of ventilation holes plays main role featuring great breathability. Secure and snug fit is provided by fused overlays (FantomFit) while tongue is gusseted using elastic fabric named Meta-Lock (already available in other NB running shoes like Fresh Foam Boracay v3). Typical logo from american brand on both sides get custom decoration to mimick fast movement so runners can identify the 1500 v4 as a legit member of the racing lineup. As mentioned above, there is no change in midsole and outsole, even 6 mm drop remains the same. Cushioning relies on full length of light and responsive REVlite (no Fresh Foam available here yet) which is already well known from other popular shoes from the american brand like its counterpart for neutral runners 1400 v5. Classical solution with higher density foam in the midfoot provides progressive pronation control combined with additional arch support and torsional stability powered by light, flexible TPU shank (T-Beam) in the midfoot. Outsole keeps design and materials so durability is not one of its strong points.